The feet are often overlooked, but in reality they’re an essential part of our body. They play a huge role since they support the weight of our body when we walk, stand, run and jump. No wonder feet pain can be so devastating. Close-toed shoes and high heels only make the problem worse. The most common cause of foot pain is due to plantar fasciitis. The condition is really painful and it’s caused by inflammation of the tissue on the bottom of the foot, all the way to your toes and heels. The condition is mainly caused by repetitive movements, bad footwear, lack of stability and strength and obesity. Other symptoms of the condition include stabbing pain along the bottom of the foot, calf tightness and intense pain during the morning and after working out. If you suffer from plantar fasciitis, there are simple exercises that can help you relieve the pain. Do these stretches and exercises two times a day to relieve foot pain. All you need is a tennis ball and a yoga block. How to do it: Place the yoga block in front of your feet. Step into the block with both feet. Lower your left heel towards to feel a stretch through your calf and foot. Press up through the ball and flex your calf muscle. Do 10 repetitions and then do the same with the other leg. How to do it: Step on the block with your toes and ball of your foot onto the center of it. Lift your heel up high to feel a stretch. Slowly shift your weight forward to deepen the stretch. Hold the position for 3 seconds and then repeat with the other foot. Do 3 repetitions on each side. How to do it: Place a tennis ball on the floor in front of you and sit on a chair. 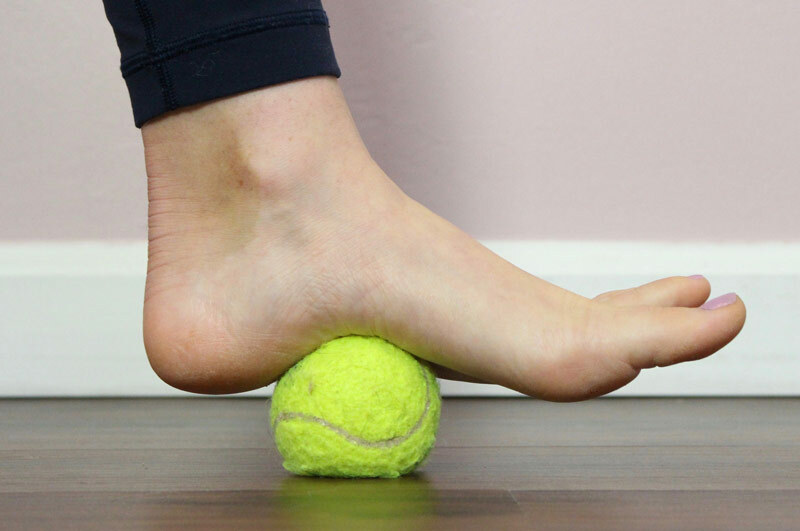 Place the arch of your foot on the ball and apply some pressure to feel tightness releasing. Slowly begin to roll your foot over the ball, towards the toes. Pause when you find a tight spot and hold for 30 seconds. Slowly roll back towards the heel. Do the same with the other foot. How to do it: Place the tennis ball in front of you and sit on a chair. Place your forearms onto your thighs. Your heel should be placed on top of the ball, while the ball of your foot should be on the floor. Start pumping your heel up and down on the ball. Do this for 60 seconds and then repeat the same with the other leg. How to do it: Keep your heel on the floor and the ball of your foot on the tennis ball. Curl your toes around the ball and squeeze for a moment. Release and spread your toes widely. Do 10 repetitions and then do the same with the other foot.